Reading and share top 22 famous quotes and sayings about Meaning Of Music by famous authors and people. 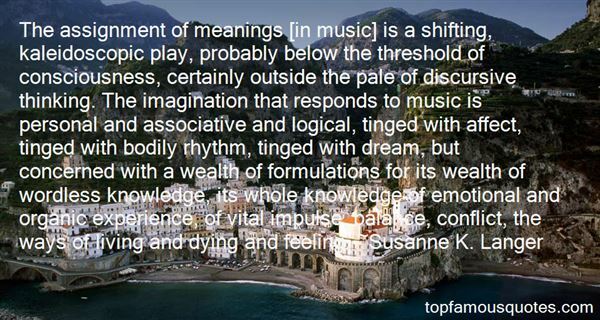 Browse top 22 famous quotes and sayings about Meaning Of Music by most favorite authors. 1. "Everyone's just extracting meaning and feeling and emotion from almost every aspect of music, and I think that for me, it's a huge antidote to that to have a concept album." 2. "We must abandon completely the notion of blaming the past for any kind of situation we're in and reverse our thinking and see that the past always flows back form the present. That now is the creative point of life. So you see its like the idea of forgiving somebody, you change the meaning of the past by doing that...Also watch the flow of music. The melody as its expressed is changed by notes that come later. Just as the meaning of a sentence...you wait till later to find out what the sentence means...The present is always changing the past." 3. "Ordinary life does not interest me. I seek only the high moments. I am in accord with the surrealists, searching for the marvelous. I want to be a writer who reminds others that these moments exist; I want to prove that there is infinite space, infinite meaning, infinite dimension. But I am not always in what I call a state of grace. I have days of illuminations and fevers. I have days when the music in my head stops. Then I mend socks, prune trees, can fruits, polish furniture. But while I am doing this I feel I am not living." 4. "Memory is the grid of meaning we impose on the random and bewildering flux of the world. Memory is the line we pay out behind us as we travel through time--it is the clue, like Ariadne's, which means we do not lose our way. Memory is the lasso with which we capture the past and haul it from chaos towards us in nicely ordered sequences, like those of baroque keyboard music." 5. "But no, music lasted longer than anything it inspired. After LPs, cassettes, and CDs, when matrimony was about to decay into its component elements—alimony and acrimony—the songs startled him and regained all their previous, pre-Rachel meanings, as if they had not only conjured her but then dismissed her, as if she had been entirely their illusion. He listened to the old songs again, years later on that same dark promenade, when every CD he had ever owned sat nestled in that greatest of all human inventions, the iPod, dialed up and yielding to his fingertip's tap. 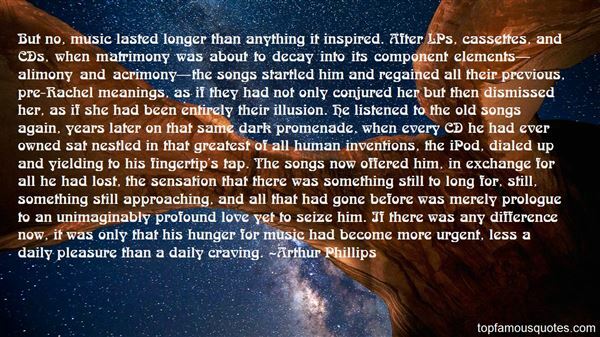 The songs now offered him, in exchange for all he had lost, the sensation that there was something still to long for, still, something still approaching, and all that had gone before was merely prologue to an unimaginably profound love yet to seize him. If there was any difference now, it was only that his hunger for music had become more urgent, less a daily pleasure than a daily craving." 6. "We're thinking about printing the lyrics with the next record so that people can find their own meaning in them. But then they would start having a life of their own, and I think the Portishead music should stay a whole in which the lyrics come second, actually." 7. 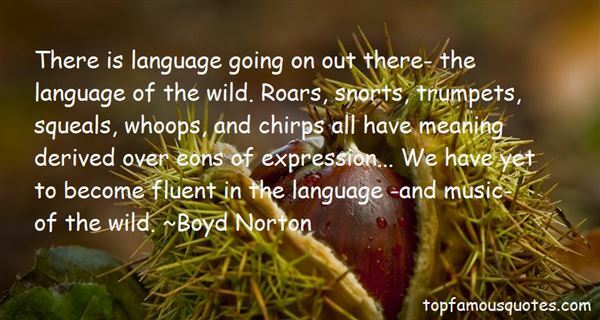 "There is language going on out there- the language of the wild. Roars, snorts, trumpets, squeals, whoops, and chirps all have meaning derived over eons of expression... We have yet to become fluent in the language -and music- of the wild." 8. "Once, somebody asked Robert Schumann to explain the meaning of a certain piece of music he had just played on the piano. What Robert Schumann did was sit back down at the piano and play the piece of music again." 9. "Yes, but bad language is bound to make in addition bad government, whereas good language is not bound to make bad government. That again is clear Confucius: if the orders aren't clear they can't be carried out. Lloyd George's laws were such a mess, the lawyers never knew what they meant. And Talleyrand proclaimed that they changed the meaning of words between one conference and another. The means of communication breaks down, and that of course is what we are suffering now. We are enduring the drive to work on the subconscious without appealing to the reason. They repeat a trade name with the music a few times, and then repeat the music without it so that the music will give you the name. I think of the assault. We suffer from the use of language to conceal thought and to withhold all vital and direct answers. There is the definite use of propaganda, forensic language, merely to conceal and mislead." 10. "But an essentially mechanical world would be an essentially meaningless world! Suppose that one assessed the value of a piece of music according to how much of it could be counted, calculated, put into formulas; how absurd such a 'scientific' assessment of music would be! What would one have comprehended, understood, known about it? Nothing, absolutely nothing of what is really 'music' in it!" 11. "Either your understanding of the meaning of music is there from the beginning or it is not." 12. "A game master or teacher who was primarily concerned with being close enough to the "innermost meaning" would be a very bad teacher. To be candid, I myself, for example, have never in my life said a word to my pupils about the "meaning" of music; if there is one it does not need my explanations. On the other hand I have always made a great point of having my pupils count their eighths and sixteenths nicely. Whatever you become, teacher, scholar, or musician, have respect for the "meaning" but do not imagine that it can be taught." 13. "Perfect music has its cause. It arises from equilibrium. Equilibrium arises from righteousness, and righteousness arises from the meaning of the cosmos. Therefore one can speak about music only with a man who has perceived the meaning of the cosmos." 14. "I think things can have more than one meaning and still connect with people. There's a lot of meaning to the title 'Music For People' and they're all true and they're all accurate." 15. "And to understand this, I think this is a most important point where I would like always to be understood what we do with the New York Philharmonic. That the meaning of the music is number one." 16. "Trout sat back and thought about the conversation. He shaped it into a story, which he never got around to writing until he was an old, old man. It was about a planet where the language kept turning into pure music, because the creatures there were so enchanted by sounds. Words became musical notes. Sentences became melodies. They were useless as conveyors of information, because nobody knew or cares what the meanings of words were anymore. So leaders in government and commerce, in order to function, had to invent new and much uglier vocabularies and sentence structures all the time, which would resist being transmuted to music." 17. "Among all the other nights upon nights, the girl had spent that one on the boat….when it happened, the burst of Chopin…. There wasn't a breath of wind and the music spread all over the dark boat, like a heavenly injunction whose import was unknown, like an order from God whose meaning was inscrutable. And the girl started up as if to go and kill herself in her turn, throw herself in her turn into the sea, and afterwards, she wept because she thought of the man from Cholon and suddenly she wasn't sure she hadn't loved him with a love she hadn't seen because it had lost itself in the affair like water in the sand and she rediscovered it only now, through this moment of music." 18. "What an odd thing it is to see an entire species -- billions of people -- playing with, listening to meaningless tonal patterns, occupied and preoccupied for much of their time by what they call 'music.' (-- The Overlords, from Arthur C. Clarke's Childhood's End)"
19. "If not for music, I would probably be a very frustrated scientist. It's one way to answer the question, 'What is the meaning of life?' I feel music answers it better." 20. "Our human tragedy is that we are unable to comprehend our experience, it slips through our fingers, we can't hold on to it, and the more time passes, the harder it gets...My father said that the natural world gave us explanations to compensate for the meanings we could not grasp. The slant of the cold sunlight on a winter pine, the music of water, an oar cutting the lake and the flight of birds, the mountains' nobility , the silence of the silence. We are given life but must accept that it is unattainable and rejoice in what can be held in the eye, the memory, the mind." 21. "The assignment of meanings [in music] is a shifting, kaleidoscopic play, probably below the threshold of consciousness, certainly outside the pale of discursive thinking. The imagination that responds to music is personal and associative and logical, tinged with affect, tinged with bodily rhythm, tinged with dream, but concerned with a wealth of formulations for its wealth of wordless knowledge, its whole knowledge of emotional and organic experience, of vital impulse, balance, conflict, the ways of living and dying and feeling." 22. "The basic idea of a hyper instrument is where the technology is built right into the instrument so that the instrument knows how it's being played - literally what the expression is, what the meaning is, what the direction of the music is." Talking in one language and talking in another, I think inevitably, produce two different personalities, as far as I've seen in other people. I assume it does the same for me."